Monday - Bitsy's Brain food Lemon Broccoli Smart Cookies - This was not love at first sight, Lily was worried they wouldn't be good because of the flavor but she loved them! Tuesday - Smart Kids Banana Split Bar - We've never seen this brand but Lily enjoyed it so much! She loved how different the flavor was and said it was like eating ice cream. Wednesday - Stretch Island Fruit Co Autumn Apple Fruit Strip - Lily loved this fruit strip, she's usually picky about her "Fruit Roll-ups" but she enjoyed this one a lot. Friday - Lily had two snacks on Friday (One for School and the other for Dance) Kashi Chocolate Almond and Sea Salt Granola Bar - The only thing Lily didn't like about this granola bar was the salt. Bare Fuji Red Apple Chips - Great snack for dance! Lily loves Bare. She said it's like eating apples but without the mess. Saturday - MixtBag Yellow and Blue Corn Tortilla Chips - Lily loves chips and she really loved this brand. This was a great week. Lily tried a few new things and loved everything. I'm enjoying watching her want to try new things! This is definitely by far one of my favorite subscription boxes. 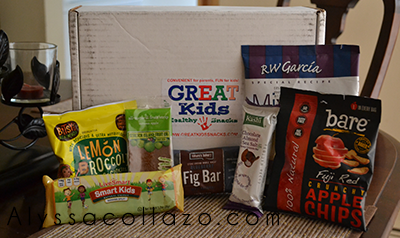 Be sure to check back next week for Week 4 of our Great Kids Snack Box adventure. My kids would love getting a box like this. Great way to introduce healthy snacks. That sounds like a great snack box. I am always looking for healthy snacks for my daughter. It occurs to me that this would be a fun box to take for a sleepover party. Sounds like a great subscription service. Looks like a lot of great yummy snacks. Would be perfect for my daughter. These look like great snacks for the kids! Yum!! I'm sure I'd be with Lily on loving the blueberry fig the most. I've never heard of broccoli in a cookie! Such a great way to try new things and to let the little ones learn to try new foods. What fun snacks for kids. My son love Bitsy's Brain food Lemon Broccoli Smart Cookies. They're really good. I'm not a kids, but those snacks certainly sound tasty to me! This sounds like an amazing box. My son would totally eat this up...lol literally! I love this! This is such a great way to find great snacks that are all natural and organic! My kind of snack box!